If you have a patio or sidewalk around your home, you have probably noticed small ants emerging from the cracks in the surface. These sidewalk ants, or pavement ants, build their nests beneath rocks, bricks or sidewalks, and small piles of excavated earth surround the entrances to their home. Though the ants are not extremely harmful, they may make their way inside your home through cracks in foundation walls and other openings in search of food. Pavement ants are often found along sidewalks. Locate the entrances to the ant nest. Look for ant activity around small, craterlike dirt piles. The little dirt piles are soil the ants have removed from beneath the sidewalk to make their tunnels. The ants are likely using several entrances. Place a protein-based ant bait trap within 12 to 24 inches of the nest entrances. Bait traps are available at any home improvement store, as well as most grocery stores. Most outdoor bait traps have stakes built into the bottom so you can drive them into the ground so that they stay in place. The ants carry the poisoned bait down into their nest, where members of the colony eat it and die. Bait traps are useful if you have children and pets, as they are a safer alternative to spraying pesticides. Allow one week for the bait traps to do their job before trying another method. Observe the area for ant activity for one week. 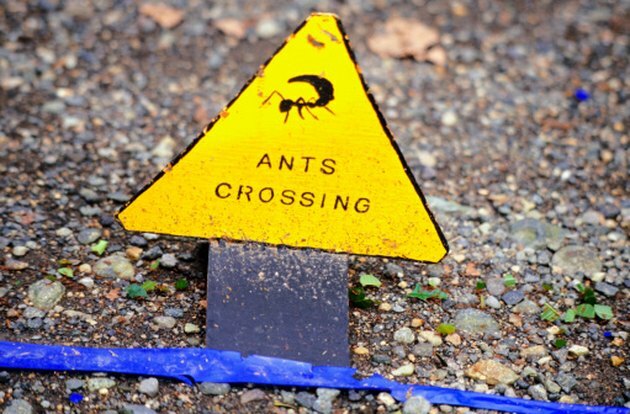 If you still notice large amounts of ant activity after the bait traps have been out for a week, it's time to try another method to kill the ants. Spray the areas around the nest entrances with an insecticide containing cypermethrin. Cypermethrin is used as a crack and crevice treatment for ants and other insects. Cypermethrin is available in both liquid and powder. Apply the liquid or powder to all nest entrances and to all cracks and edges of the sidewalk. Keep children and animals away from the area for at least 12 hours.